My recap post just went up. Happy New Year to you as well! I may not have commented on all your posts this year but have read and thoroughly enjoyed them all! Looking forward to joining you in your journey through life in 2016. Happy New Year! I have admired your dedication to your word this year and how you have really followed through. Very best wishes for 2016! Your inspiration posts have been just that: they have got me thinking and I'm so glad you decided to share your thoughts. Oh, and I ordered the Creative Girl book and I have it saved up to open next week. Thank you! You had another great year with your OLW this year---as in the precious year of FUN!! Can't wait to see what you are focusing on this year! 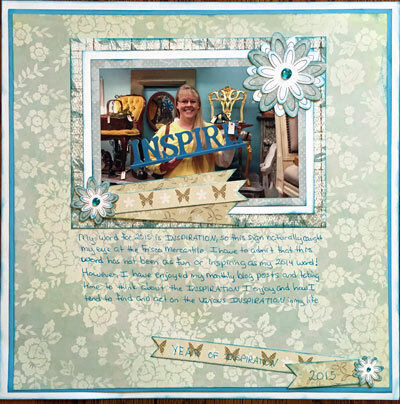 I love how that page has come together....a perfect ending to your 'inspiring' year. I'm working on my recap post, as well as my looking-forward post. I don't want to rush them, and I need more time to think them through. But I really enjoy seeing everybody else's.